I wrote about Kim Collins running 6.48 last month. He has since improved to 6.47 in the next few meets. Getting better with age. An inspiration. I also discussed in that article how a THEORETICAL formula, based on the past world record holders, that a 1.53 X 60m time can be used to extrapolate potential. Thus 6.53 seconds would be “the minimum” to break 10 seconds. GBR’s Chijindu Ujah is a prime example: 9.96 for 100m and 6.53 for 60m. 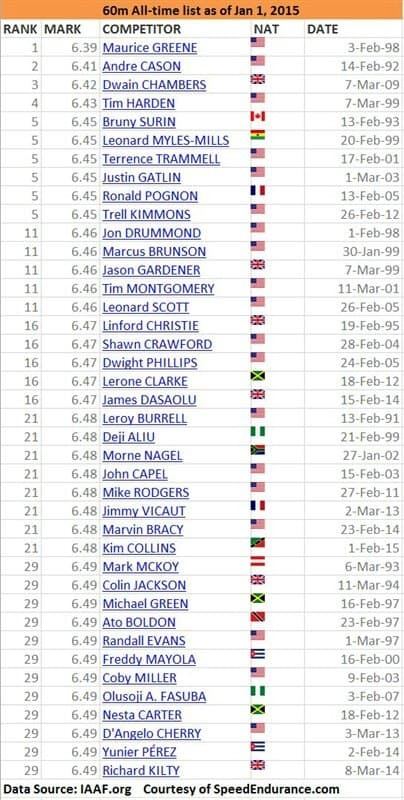 In that article, I also had a list of the 40 top 60m times below 6.50 seconds. However, Ireland’s Ian Graham quickly pointed this out to me. Thus, the “take your 60m times X 1.53 to BREAK 10 seconds” rule is only 70% accurate! MORAL OF THE STORY: the best way to determine your 100m time is to run 100m. 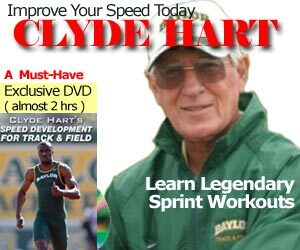 READ What is Speed Endurance training?